Do you have islander ancestry? This book is divided into two main sections. 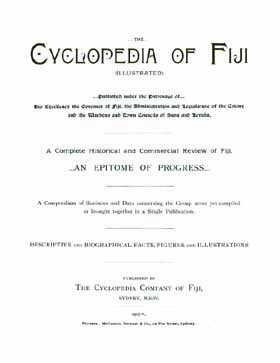 The first containing a cyclopedia of Fiji and the second containing smaller cyclopedias of Samoa, Tonga, Tahiti and the Cook Islands. These cyclopedias are a vast resource of historical and biographical information on the islands concerned. They are very similar to the cyclopedias for each Australian state although less comprehensive. Cyclopedias generally include information on the history, the people, the industries and trade, the culture and the geography of the island group concerned. They include hundreds of illustrations, the larger number of these being portraits of those whose biographies are included. These are not just the rich and famous, but include a high percentage of the ordinary citizens in each community. This is a terrific genealogy resource for anyone exploring their family history in these regions and building a family tree.